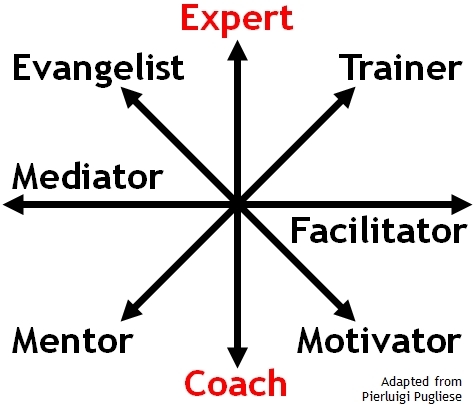 Pugliese recently gave a presentation in Prague on coaching, and his deck included a diagram similar to the one above. He notes that a coach working with a software development team will play these eight roles, and going a step further, I find this a compelling model for the range of roles that must be played by every leader in any group. I've re-organized Pugliese's schema by pairing up the roles along four axes, each of which represents a different dimension of leadership behavior, and the definitions below are my own, so don't blame Pugliese if you disagree. The Mediator seeks to resolve conflict and maintain harmonious relationships in the service of group effectiveness. The Facilitator seeks to maximize learning and ensure that all voices are heard in the service of candor, integrity and authenticity. To me the question isn't "What type of leader am I?" but rather "Can I adjust my leadership style to best fit the needs of the situation? Am I flexible and adaptable as a leader? Can I sense what is called for and deliver it?" Pierluigi Pugliese is the founder and managing director of Connexxo, and he's also on Twitter.